Paris, 3 October 2015 – Eutelsat Communications (NYSE Euronext Paris: ETL) announces that its new EUTELSAT 8 West B has been fully powered up and is already broadcasting TV channels to over 52 million homes in the Middle East and North Africa. Launched on August 20 by an Ariane 5 rocket, the new high-power satellite is co-located with a constellation of satellites operated by Eutelsat and Nilesat at the 7/8 degrees West neighbourhood. Working in close collaboration with clients, Eutelsat completed a seamless upgrade in the night of September 30 of over 210 television channels onto the new satellite from two Eutelsat satellites located at 7/8 degrees West. Both satellites are now being relocated, enabling Eutelsat to further optimise its fleet*. 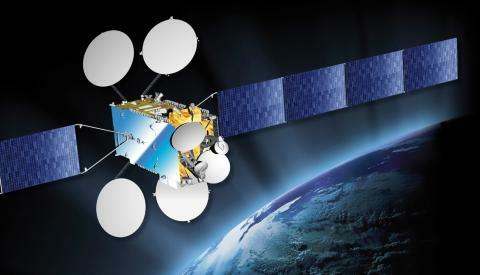 The additional capacity on EUTELSAT 8 West B will enable over a hundred further channels to be accommodated. For the Arab and international broadcasting community the entry into service of EUTELSAT 8 West B marks a milestone in the growth story of the most popular satellite TV neighbourhood in the Middle East and North Africa, watched by 250 million viewers. Channels can benefit from increased power, more coverage options and higher in-orbit security, as well as a future-proof infrastructure for High Definition TV and Ultra HD. These features underpin the 100% success in sales of capacity connected to its Ku-band footprints stretching from Morocco to the Gulf. EUTELSAT 8 West B also introduces C-band capacity to 7/8 degrees West, connected to footprints covering the African continent and reaching west to South America. "We are delighted to see this prestigious satellite take its place at the 7/8 degrees West neighbourhood and to be able to further enhance the service we provide broadcasters and service providers in one of the world's most dynamic TV markets," said Michel de Rosen, Eutelsat Chairman and CEO. "EUTELSAT 8 West B, built by Thales Alenia Space, is one of the most sophisticated broadcasting satellites in orbit today and enables us to deploy new features that raise the game in terms of service, flexibility and signal quality." * EUTELSAT 8 West A being redeployed to 12.5 degrees West. EUTELSAT 8 West C being redeployed to 33 degrees East.